Being a parent of a teen is hard enough, but when you throw disabilities into the mix, the role can seem downright overwhelming. In the third episode of a series on caregiving, Dr. Daniel Amen and Tana Amen discuss ways you can overcome these challenges and model the proper behavior to put your teen in an environment in which they can thrive. Tana Amen:	And I'm Tana Amen. In our podcasts, we provide you with the tools you need to become a warrior for the health of your brain and body. 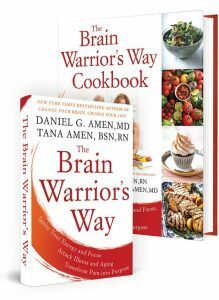 Dr Daniel Amen:	The Brain Warrior's Way Podcast is brought to you by Amen Clinics, where we have been transforming lives for 30 years using tools like brain SPECT imaging to personalize treatment to your brain. For more information visit amenclinics.com. Dr Daniel Amen:	Welcome back. We're in caregiver week we're teaching you how to manage your mind your thoughts. One quick review from SKS 311 from the United States, “Alcohol, the holiday spirit you're better off without.” An eye opener, very interesting podcast. So we've been talking about caregivers and I want to move into teenagers because they're often not grateful for all the effort [crosstalk 00:01:28] and young adults. Tana Amen:	Well, sometimes they are the ones that people feel the most triggered by, notice I said triggered by, it's not that they trigger you. It's that you get triggered by because you're sort of allowing that to happen. Dr Daniel Amen:	Well, and one of the things people don't know is when you have children, at each age your child is at, unconsciously you're going and reliving what happened when you were that age. Tana Amen:	So powerful for me. Dr Daniel Amen:	So Chloe is 15, almost 16 and that was actually a really hard time for me. Tana Amen:	It was. She's a really good kid, but I started to notice I was having some anxiety over her growing up. And so yeah, it can be triggering and I started to notice that I started to hold on a little bit, and I think it's because that was a hard age for me. This was powerful for me to learn because it was a hard age for me and just making a couple of little shifts in my language with her made a massive difference. So it was really empowering. Dr Daniel Amen:	... makes a massive difference when you get involved and active listening. I think parents often get themselves into hot water by not allowing enough space between the end of what a child says and you talking over them. And I know I've been guilty of that because you want and if you're an extrovert, like we are, both of us are, you want to say what's on your mind. Tana Amen:	Well, and if you feel like you've got some education and something [inaudible 00:03:12] you want to share. So yeah, but what I noticed is listening, which is something you've helped me with for a long time now, and it's not always easy if it's not your nature. You have to work on it. But that was one thing. But also, I learned this from love and logic. And I love this. And make no mistake, you do have to learn how to draw boundaries, strong boundaries with teenagers, but in a different way, perhaps. So it may work better to start changing the way you do it. And then the next thing that I learned was asking her. Telling her, “Look, I'm a mom. I'm sorry for occasionally acting like one.” Because I want to be a good coach too. So why don't you help me out and give me a heads up. Give me a heads up for when you want me to just listen and take it in and just be a sounding board because we're really close and you do that sometimes or when you actually want my advice. Let me know when you want my advice or when you want me to just be quiet. If it's something really important and you just want me to listen, I will because I may not know. Tana Amen:	Head injury or a sister. Yeah. Dr Daniel Amen:	Maybe there's something going on with their brain that you're not aware of. Tana Amen:	That's what we see every day. Dr Daniel Amen:	That's what we see every day. What's going on, and what's going on with your brain? Are you taking care of it? That's the first rule of being a good caregiver is that you take care of yourself so that you can be present for the other person. What's going on with your mind? Those were the four questions and turnaround that we did. With caregiving, it's so important to be connected and when we were in grief week and we talked with Sandra, one of the things that saved her was her connections to other people. And then I think the fourth circle, the spiritual circle or the purpose circle is what's the purpose in this. And as we are caring for your sister in the surgery and our nieces, the purpose is literally to end the cycle of mental illness in those girls and in their babies and grand babies. Tana Amen:	Well, one thing that was really interesting, 'cause I was tired by the end of the week. I was tired. So I went home, as we finally got them back to their house after week I went home took a bubble bath, put a mask on, like just relaxed, right? That's what I did for myself. Dr Daniel Amen:	Like a sorrel mask? Tana Amen:	Yeah, like a mud mask. Dr Daniel Amen:	Aha, mud mask. Tana Amen:	But I took care of myself, and then this morning my sister called and she was having this moment of just intense gratitude. And she's like, “I've never been taken care of like that. Just feeling that loved and that supported was just, I was overwhelmed by it.” And the one thing I said to her is I said, “Maybe that's something you can just remember the next time someone needs you, when you need to take care of them.” So modeling is a really important thing because when you take care of someone unselfishly, you're modeling how to take care of someone else for that person. Dr Daniel Amen:	That's so powerful. Alright. When we come back, we're going to talk about the other end of life and taking care of your own parents or people who are elderly. Stay with us. Tana Amen:	If you're enjoying the Brain Warrior's Way Podcast, please don't forget to subscribe so you'll always know when there's a new episode. And while you're at it, feel free to give us a review or five star rating as that helps others find the podcast. Dr Daniel Amen:	For more information, give us a call at 8559781363.